Before commencing any design project, whether it is building a new home or renovating an existing one, you must find appropriate professional advisors. The primary professionals are architects, interior designers and building contractors. One project may require an architect, an interior designer and a contractor, while another requires only a good contractor. This depends upon the size of your project, legalities, your skill level, and the amount of time you have to oversee the job. New construction generally requires an architect and a building contractor. 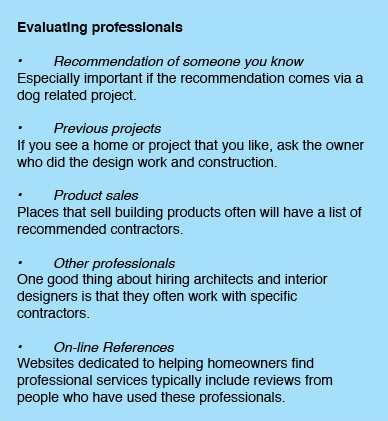 Renovation project requirements vary depending upon location. Some states or municipalities set a limit based on the square footage and/or a dollar amount to determine whether the drawings for a renovation project must be prepared by a licensed architect. It is the homeowner’s responsibility to know these regulations before beginning the project. The first rule of home construction projects is plan ahead. Architects and interior designers should be consulted months or even a year or two before you intend to begin. Homeowners, architects, designers and contractors are all guilty of underestimating the time needed to complete a home design project. This brings us to rule number two, always expect a project to take longer than initially planned and never begin a project that must be completed for a specific deadline. The building process involves countless variables that can alter or impede progress. These include weather, labor issues, accidents, material delays due to supply and demand issues, and mistakes in transportation, material and construction. Architects and interior designers are problem solvers who provide their clients with functional and creative solutions for their interior spatial needs. Considerations of health, safety and welfare of the end users of a building are documented in plans, elevations, perspectives, and models. Generally speaking, interior designers are specialists in interior materials, furnishings, lighting and finishes, while architects specialize in site work, structure and building materials. Architects are considered professionals on a par with doctors, engineers and lawyers. They must have specific educational background and professional certification to be licensed within a particular state or region. All US Architects take the Architectural Registration Examination (ARE). In addition to this national exam each state issues its own license limiting practice to that specific state. Licenses are extended to other states by reciprocity agreements or additional exams. Interior designers work is restricted to non-structural elements. They are not legally permitted to design or make changes that are structural or involve mechanical systems such HVAC. Licensing and certification of interior designers is a fairly recent innovation. Requirements vary from state to state and by countries. Currently, over 25 US states and 8 Canadian provinces have an education, examination, registration, certification or licensing requirement. Both professions begin from a starting point of researching physical elements and components to find the most appropriate design solution to meet the client’s functional and aesthetic needs. They are well versed in their area of expertise but do not assume this encompasses many of the design dilemmas facing dog owners. Unless you evaluate their suggestions from this perspective you may face the unhappy reality of resolving a canine design issue and creating a new one in the process. For instance, a decorative fence can be an effective visual screen to stop a dog from barking at passersby. But this will be a profoundly inadequate solution if the dog repeatedly gets his head or leg stuck in the fence’s decorative cut outs. General contractors supervise the construction or development of a building. They may use their own employees or hire sub-contractors. Sub-contractors are often independent contractors in a specialty field, such as electricians or plumbers. The function of the general contractor is to order materials, manage sub-contractors, and obtain necessary permits and all required construction inspections. While most general contractors and sub-contractors have sufficient skills based on experience and education, they may occasionally be unfamiliar with newer products on the market. Discuss this early in the design stage, particularly if you are using new technology, materials or processes. Also, construction techniques can vary by region so be prepared for some differences of opinion and technique if you are moving to a new area. Get a minimum of three quotes on your project before you make a final decision about a professional. An architect or interior designer should be able to estimate cost for the design phase and general cost of construction. Contractors can give a cost estimate based on square footage and quality, but it will be easier for them to give a quote once they have some drawings in hand. Any architect, interior designer or contractor should tell you exactly what services they can provide as part of their quote. For architects and interior designers this includes everything from construction drawings to overseeing the construction of the entire project. Even though the architect or designer may be providing non-tangible services it could save you a lot of time, headaches and even money down the road. Check all license, bonding and references. The Better Business Bureau, state board for the specific profession and the state’s attorney general can provide information on consumer complaints. Get everything in writing before the job begins, including completion guarantees (time and dollars), cost overrun approvals, penalties, and legal redress. No professional architect, interior designer or contractor would work without a written contract, so neither should you. Designers and architects will typically ask for a retainer, or percentage of the project, for the first phase of the design. This entry was posted in Building and tagged Architect, design, dogs, General contractor, interior design, pets. Bookmark the permalink.